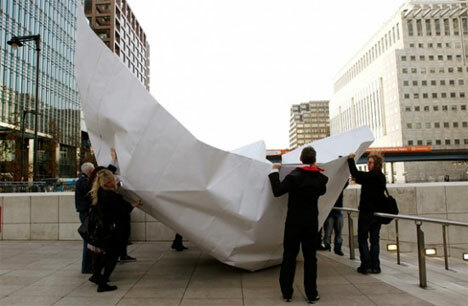 From the childhood hobby of making and sailing paper boats has sprung a truly unusual art project from German conceptual artist Frank Bölter. 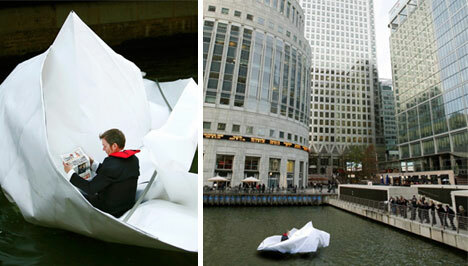 As part of the Drift 10 art exhibition in London, Bölter folded a massive origami boat with the help of some members of the public, then launched it into the waters of the Thames, hopped in and enjoyed a relaxing ride. The paper boat was reinforced with some metal poles to hold its shape, but otherwise was composed entirely of folded reinforced paper of the kind used to make juice and milk cartons. Given the highly appropriate name “HMS Origami,” the 5.4 meter (17.7 feet) boat was sturdy enough to support one passenger in the calm waters of the Thames. Although the boat wasn’t technically paper – at least not in the way that most children’s folded boats are – the origami boat is still an impressive feat of artistic experimentation. Bölter was confident enough in the water-worthiness of his craft that he laid back and read a newspaper, enjoying a leisurely sail while onlookers watched in wonder. See more in Art of Tech or under Technology. November, 2010.